After arriving at Children’s Hospital of Philadelphia, located at 34th & Civic Center Blvd, I was met by a team of doctors who were diligently working on a proper diagnosis for Samad. 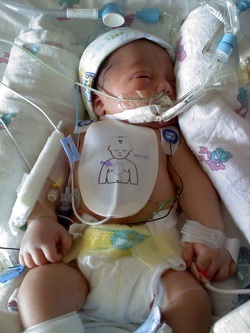 He was in an incubator, with I.V., receiving six different drugs to stabilize his little body. The next 24 hours were the worst for us, or at least from my perspective. Omar & I could not pick Samad up, he could not open his eyes, I could not even feed or change his diapers. All we could do is watch his body become weaker. Samad had been admitted to the CICU floor (Cardiac Intensive Care Unit). If you were a parent whose child had been admitted to this floor, you could sign up for a sleep room overnight. As much as Omar and I tried to get sleep, the frequent “call bell” which alerted doctor’s of a cardiac arrest, haunted our nights. So we spent most of our time, alongside his incubator, in a rocking chair, reading, praying and watching over our angel. As day 3 was coming to a close, most doctors in the CICU had lost hope, still unsure of what Samad’s condition was. He had a seizure from a drug called Lidocaine and became unresponsive. As the machines breathed for him, we were addressed by the doctors’ and asked if Samad flatlined again did we want them to resuscitate him. I screamed in agony, “Please just let him go. Let my baby go home to Allah where he belongs. I don’t want to see him like this anymore. I don’t want him to suffer anymore.” Omar said, “Kheli we are not going to give up!” So I went and I called on that mighty God I serve! Although unclean and aching from my postpartum conditions, I went back to the sleep room and I began my rakahs (prayer position during salaat). I ached and I cried and I prayed. I prostrated until I could not lift my body up off the ground anymore and I begged Allah for His mercy. We made it through the night without any changes and the next day I knew that Samad would survive and that Allah had answered our prayers. On the morning of day 4 we were met by a small woman, by the name of Dr. Maully Shah, Attending Cardiologist. She sat us down and explained that Samad had a Congenital Heart Disease called Prolonged QT Syndrome. This QT Syndrome affected the hearts rhythm and a life saving treatment of this magnitude was very rare in an infant of his size and age. Open heart surgery would be necessary if there was any chance of him surviving. Since Samad was only 4 days old and in very unstable condition, they would start off by placing temporary pacing wires and connecting them to the lower ventricle of his heart and a small device called a pacemaker would be on the outside sending currents through the wires to his heart. At this point she explained, was our only hope and she could not promise any results. They gave me & Omar some time to consult with each other and make a decision quickly because time was of the essence. The first people I contacted were our minister, Brother Rodney Muhammad and Spiritual Sister Dr. Safiyya Shabazz. Believers from all over the Nation were calling, setting up prayer lines, bringing food, and showing up to the hospital. Many had joined Omar & I on the 6th floor at CHOP. Bro Rodney would lend us the spiritual support that we needed and Sis Safiyya would give us her professional advice and became an advocate for us to bridge the gap between ourselves and his team of doctors. By now, with the advice of our Minister, Sis Safiyya and Omar’s mother, whom is a pediatric nurse in Chicago, we had given the doctors our consent to perform open heart surgery on 4 day old Samad, in an attempt to save his life. Brother Rodney Muhammad gathered the believers (Sis Safiyya, Sis Lafonda, Sis Laurie, Bro Lance, Grandmom Arlene, Sis Attilah, Sis Andrea) along the bedside of Samad and asked the doctors to join in prayer as he called on Allah to save our baby. They allowed Omar and I to walk alongside the team of surgeons, as they wheeled Samad’s incubator down the long hallway to the operating room. We got to a set of double doors, said our “see you later & love you” and parted ways. We would spend the next 2 hours pacing the 6th floor, having an occasionally laugh with family and friends but most importantly praying! Occasionally one of the nurses whom I had become very fond of, Nurse Monica, would walk out to the waiting area, just to reassure us that no news meant good news. Then finally after what seemed like forever, but in essence was a little under 2 hours, Dr. Maully Shah appeared from behind the double doors, still in surgical scrubs, perspiring from her brow. The words that came from her mouth, “The surgery was successful and uncomplicated”, still ring in my ears. Dr. Shah recanted for us the steps that had taken place and that Samad was currently being stitched up, but she wanted to deliver the great news and that we would soon be reunited with him…… “Allahu Akbar! Allahu Akbar! God be the glory”, echoed throughout the waiting area. Within an hour, Samad was back up on his pod, (open area that he shared with 3 other babies), laying in his incubator. I remember him looking so peaceful, but a nerve in my body just would not rest. Maybe it was the wires protruding from his chest, the cut down the middle of his breast bone being held together with heavy, black stitches, the 6 medications being administered intravenously all at one time. Perhaps it was the feeding tube in his belly button or the “balloon” type instrument they had placed in his heart to drain the access fluid and blood that had built up. Yes, all of those things over-crowded his small little body but yet I was focused on his face and it scared me. By now, I had learned that I would not be able to breast feed Samad as I had originally planned. My breast was engorged and I had no idea what to do. A lactation specialist visited me and said that if I pumped the milk and put it in the freezer that they could administer it through his feeding tube. All Praise be to Allah! So I began pumping, day & night. The 6th floor was like a milk factory. There was a small room, fully equipped with an electric double pump, wash sink and recliner. Each mom had to sign up for it, in 1 hour increments; then bottle, label and store your milk. I was a mom on a mission, what better way to help Samad grow stronger than for him to receive my nourishment. Things seemed to be going well, so as Omar and I finally resided to our little sleep room, laid in the abnormally small twin bed, we for the first time since the ordeal had began, felt a little at ease. However, little did we know that this was the “calm before the storm”….